Anders Wahlstedt Fine Art is pleased to present Joan Snyder / Selected Prints 1975-2018, an exhibition of eleven of Snyder’s most important prints. The show features highlights of her printmaking activity from the 1970s onward, including her newest, “hot off the press” print, Chant/Forever (2018). Since the outset of her career, Joan Snyder has been adventurous in her approach to printmaking, particularly in etching and woodcut. 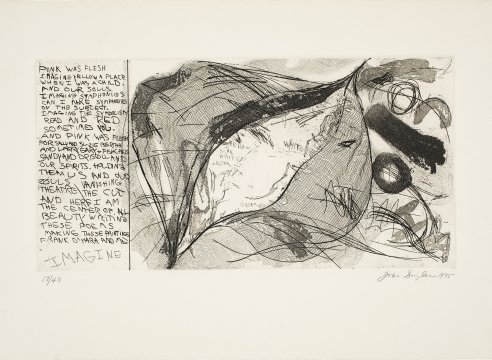 In the 1990s, she began combining different printmaking techniques and color applications in boldly untraditional ways, often making varying impressions with an open-ended inventiveness within editions that are ultimately complex to produce. Snyder’s art has always been informed by nature, by the landscape, and deals with deeply personal themes, among them female sexuality, mortality, and social injustice. The exhibition opens with Snyder’s 1975 intaglio print Imagine, a tantalizing black-and-white image combined with words expressing excitement about pink flesh, beauty, symphonies, bodies and souls – an intimate blending of her work and life inspired by a Frank O’Hara poem. Other featured works include the powerful color woodcuts Mommy Why? (1983-84) and Things Have Tears and We Know Suffering (1983-84); Field of Flowers (1993), a monoprint that is a sorrowful response to AIDS, death, and grief; and My Work… (1997), a masterful combined color intaglio and woodcut fusing female sexuality and sensibility with passionate creativity. Snyder followed these prints with …and acquainted with grief (1998), her largest print and a technical tour-de-force bursting with color; two variant impressions from the monoprint series 33 Madrigals (2001), displaying a harmonic vibrancy; and Altar (2010), which presents words and dissolving letters amid falling blossoms, cherries, and seedpod forms to evoke aspects of life and aging. Born in 1940 in Highland Park, New Jersey, Joan Snyder’s work has been presented in more than 100 exhibitions since 1970. Snyder’s art is represented in many leading American public collections, including the Metropolitan Museum of Art, Museum of Modern Art, New York Public Library, The Jewish Museum, the Solomon R. Guggenheim Museum, and Whitney Museum of American Art in New York City; the National Museum of Women in the Arts and The Phillips Collection in Washington, D.C.; the Museum of Fine Arts, Boston, and the Harvard University Museums, Cambridge; Dallas Museum of Art, Dallas; High Museum of Art, Atlanta; and the San Francisco Museum of Modern Art, San Francisco. Snyder lives and works in Brooklyn and Woodstock, New York. Please join us for an opening reception with the artist on Thursday, April 12th, from 6-8pm. A full-color, limited edition catalogue with an essay by Marilyn Symmes will be published to accompany the exhibition. For more information, contact anders@wahlstedtart.com, or call 917-868-9010.